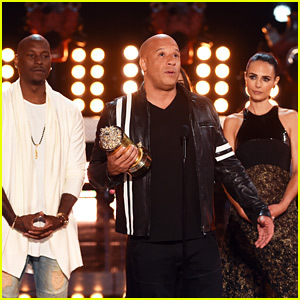 Vin Diesel, Tyrese, Michelle Rodriguez, and Jordana Brewster accept the Generation Award for the cast of The Fast and the Furious at the 2017 MTV Movie & TV Awards. During the speech, Vin stressed the idea that the cast is a family, and the cast couldn’t be there without thanking and remembering the late Paul Walker. Paul starred in the franchise, and tragically passed away in November of 2013. FYI: Jordana is wearing an Antonio Berardi dress and Alexis Bittar earrings. 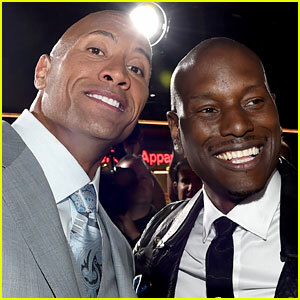 Tyrese and The Rock have worked together on the Fast and the Furious films, and fans have been trying to sleuth who the “candy asses” are on set. “Does any of us know why bro decided to jump out there with his post? No…… Would one assume that IF he’s going to jump out there and generalize and say ‘Male Co-Stars’ he would be more clear and call out names??? Of course he should of,” the 37-year-old actor wrote. “Let me calm you guys all the way down…….. I don’t know WHO he has a problem [with] and I don’t have any details of WHAT those problems are – as a matter of fact if I DID know I would tell you s**t!! !,” Tyrese wrote in a now deleted Instagram post (which you can see below). “DJ happens to be one of the most humble, down to earth and professional people I’ve ever worked with and more importantly he’s my brother we have NEVER had a problem and will never have a problem,” Tyrese added. It has since been revealed that The Rock had a problem on set with Vin Diesel. 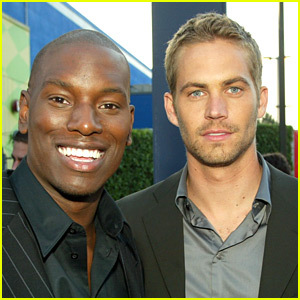 Tyrese is paying tribute to his former Fast & Furious co-star Paul Walker two years after the actor’s tragic death. “It’s still not easy…… 2 years ago today… We lost our brother….. Today I’m just gonna lay low and process…..” the 36-year-old entertainer wrote on his Instagram account. “Clarity through Prayers and perspective is what I always seek and pray for…. With a heavy heart I post this….. Please continue to pray for the Walker family and his real friends who was with him every single day…. They’re some of the best and strongest people I know…… I know you’re in heaven smiling and rooting for us all….. #RIH (Rest in heaven),” he continued. See the photo that he shared below. Heidi Klum strikes a pose while arriving at Sean “Diddy” Combs‘ Exclusive Birthday Celebration on Saturday evening (November 21) in Beverly Hills, Calif. The 42-year-old Project Runway host was joined at the bash by Amber Rose, Wiz Khalifa, Scooter Braun, Ludacris, Bow Wow, French Montana, Janelle Monae, Miguel, Tyrese, Vin Diesel, Christina Milian, Kerruche Tran, and more. Guests enjoyed specialty Ciroc Vodka cocktails, yummy hors d’oeurves, and music by DJ D-Nice, DJ Mos, and DJ Kiss. FYI: Diddy is wearing Ermenegildo Zegna. Nick Jonas proves he’s definitely meant to be on Billboard’s “Men Of Style” list as he arrives for the mag & Jimmy Choo Music’s Men of Style event held at a private residence on Friday (August 28) in Los Angeles. The 22-year-old “Chains” singer chatted it up with Mark Ronson, Pete Wentz (who posed with Jimmy Choo creative director Sandra Choi), Joe Trohman, Rashida Jones, Courtney Love, Samantha Ronson and many others at the private event which celebrated select male artists featured in Billboard‘s first Music’s Men of Style portfolio. Nick is featured in the portfolio along with Miguel, Mark, Adam Lambert, Wiz Khalifa, Brandon Flowers, Fall Out Boy, and Leon Bridges. Later on, Nick met up with BFF Demi Lovato to perform at a pre-VMAs concert. FYI: Nick is wearing Jimmy Choo shoes and a Bulgari watch. Rashida is wearing Jimmy Choo shoes and carrying a clutch. Joe is wearing Jimmy Choo shoes.